TIGER CAN'T SLEEP and READ TO TIGER. She lives and writes in Tennessee . . . Soon after I learned to read, my assignment at school was to write a book . . . or rather, write down the words of someone else's book. The book was CORDUROY by Don Freeman. Slowly and carefully I "wrote" CORDUROY . . . word by word, page by page. When I finished, my teacher helped tie all of the pages together to make a book. I knew I hadn't actually written the book, but in a magical way, it almost felt as if I had. Many, many, many years later, I "made" my first real book (and this time I actually wrote it!). 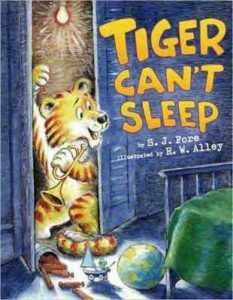 🙂 Thanks to my wonderful editor and everyone at Viking Children's Books, my book, TIGER CAN'T SLEEP, was published! And by fun coincidence my publisher was Viking, the same one that published CORDUROY! 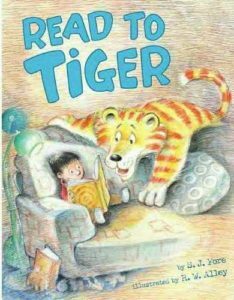 Then along came another TIGER book!